A California startup, Prynt, plans to start selling a $150 case for smartphones later this year. It includes a built-in color photo printer with technology from Zink Imaging of Billerica, a spinoff from Polaroid Corp. In the waning months of 2013, a Massachusetts company called Zink Imaging — one of the last local vestiges of Polaroid Corp. — was laying off employees. A pair of French entrepreneurs were conceptualizing a smartphone case that would be able to print photos. And Steve Herchen had decided to move from Plymouth to Germany, to join something called the Impossible Project. All of these people and companies share a single, quixotic belief — that in the age of smartphone photography and a thousand ways to share pictures in digital form, you feel a void. Deep inside, you still want to print a photo in a few seconds — a photo to hand to your friend after a great ski run, or post on the fridge right after Valentine’s Day dinner. You miss the photograph as a physical souvenir of an experience, as opposed to a glowing bunch of pixels on your Facebook feed. Are they bonkers? After all, if you want a photo, an inkjet printer at home can do a decent job with special photo paper. Or you can upload images to a website and pick them up at your neighborhood drugstore. But it doesn’t compare, in the words of Herchen, to that experience that people of a certain age can remember: “Watching the magic” as an image you just captured appears on paper. Before the iPhone, one of the most miraculous consumer technologies was the Polaroid Land camera, first sold in Boston’s Jordan Marsh department store in 1948. In 1977, a week after earning his doctorate in chemistry at MIT, Herchen showed up for work in the Cambridge laboratory of Polaroid founder Edwin Land. Herchen was the company’s vice president of research and development by the time Polaroid filed for bankruptcy in 2001 — burdened by debt and pummeled by digital photography. He and other employees had worked since the late ’90s on a new way to produce digital photos without requiring ink. Instead, it used paper coated with layers of special dye crystals to produce the colors cyan, yellow, and magenta when exposed to heat. That technology was spun out from Polaroid in 2005 to create Zink Imaging, with Herchen as chief technology officer. By 2008, Zink’s technology began showing up in handheld printers like the PoGo Instant Mobile Printer. At $150, it could connect to digital cameras or smartphones and produce 2-by-3-inch photos. The 2x3 Zink paper costs about 50 cents a sheet. Over its 10-year life, Zink has raised nearly $150 million. Yet it still hasn’t had a hit product, or proven that consumers still hunger for that physical souvenir. David Laituri, a Wayland industrial designer who briefly worked at Polaroid, says part of the problem for Zink is digital photography eliminates the headache of stocking up on film or special paper. Zink began laying off employees in the fall of 2013, part of a restructuring to change Zink from a company immersed in R & D to one commercializing technology, said chief executive Mary Jeffries. Zink has since slashed employment to 20 from a peak of 140; several top executives, including Herchen, also moved on. The Impossible Project, where Herchen now serves as chief operating officer, owns a former Polaroid facility in the Netherlands — the last plant where the company made instant film. It sells refurbished Polaroid cameras, cartridges of instant film, and a new product called the Instant Lab Universal. 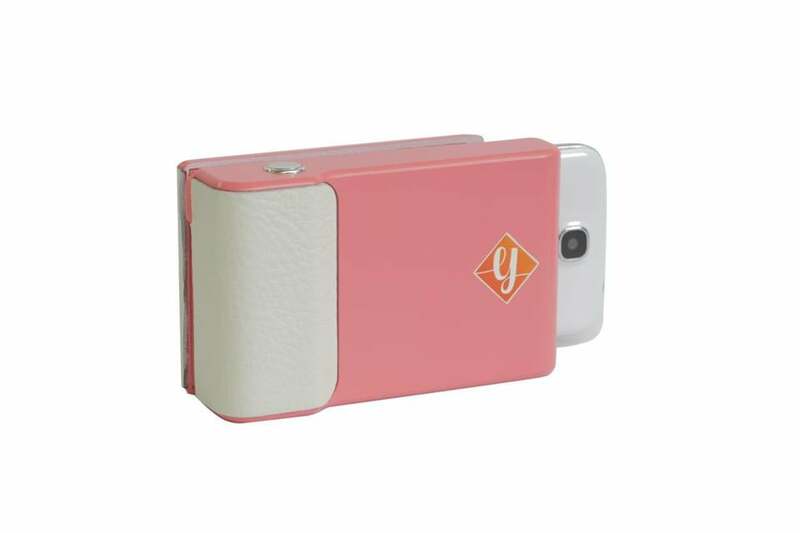 That $249 device allows you to capture pictures displayed on a smartphone screen and have them printed on instant film. Why, exactly? “There’s something about the appeal that is still there with an analog, instant, one-of-a-kind print,” Herchen asserts. There’s some evidence that may actually be true. A campaign this month on the funding site Kickstarter from a startup called Prynt raised more than $900,000. Prynt, founded by two French entrepreneurs now working in California, is developing a case for smartphones that has a built-in Zink printer. Co-founder Clément Perrot says the product, priced around $150, should be on store shelves in time for the holidays. Not only does it produce a printed photo in about 30 seconds, but the companion Prynt mobile app also records a few seconds of video around the moment you click the button. When you hold the printed photo in front of the smartphone, it brings that image back to life by replaying the few seconds of video. And how did Perrot, who is 24, first get exposed to instant photography? Growing up in the suburbs of Paris, he was enchanted by an old camera his grandfather gave to him. A Polaroid. Scott Kirsner can be reached at kirsner@pobox .com. Follow him on Twitter @ScottKirsner and on betaboston.com.